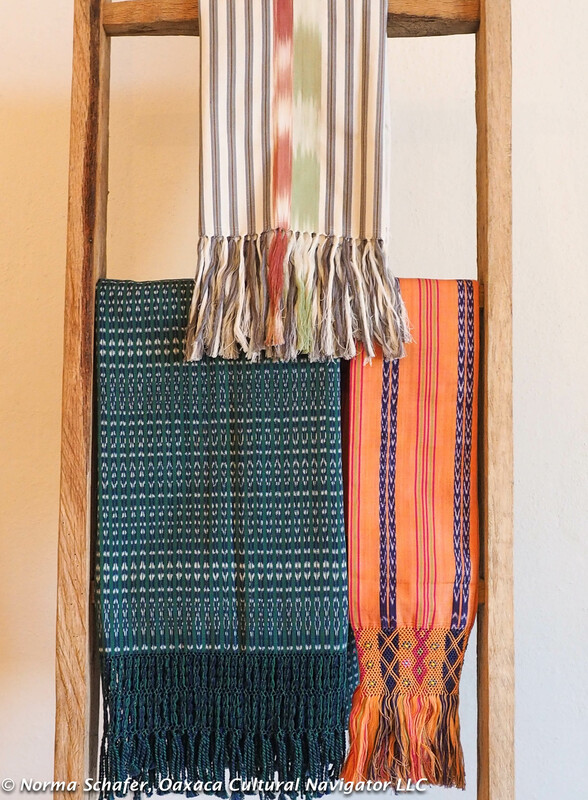 It’s easy to get carried away and fall in love with ikat cotton rebozos in Tenancingo de Degollado, Estado de Mexico. 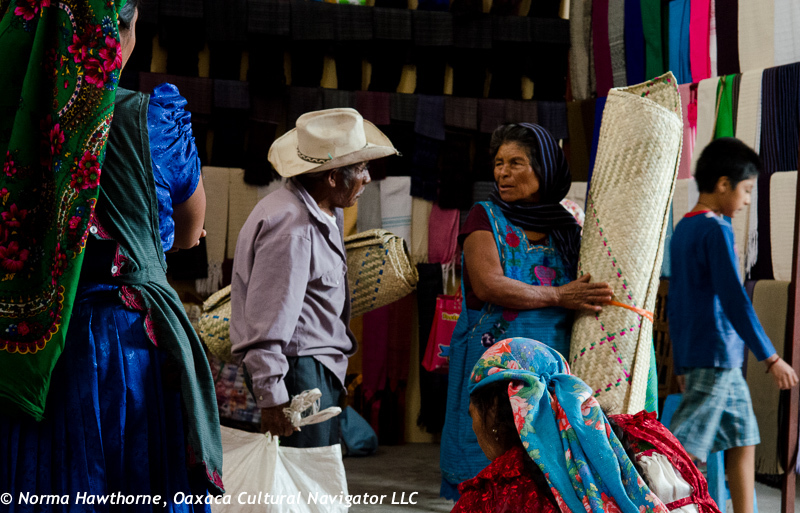 Of course, I bought a few too many during our recent Mexico Textiles and Folk Art Tour Study Tour: Tenancingo Rebozos and More! 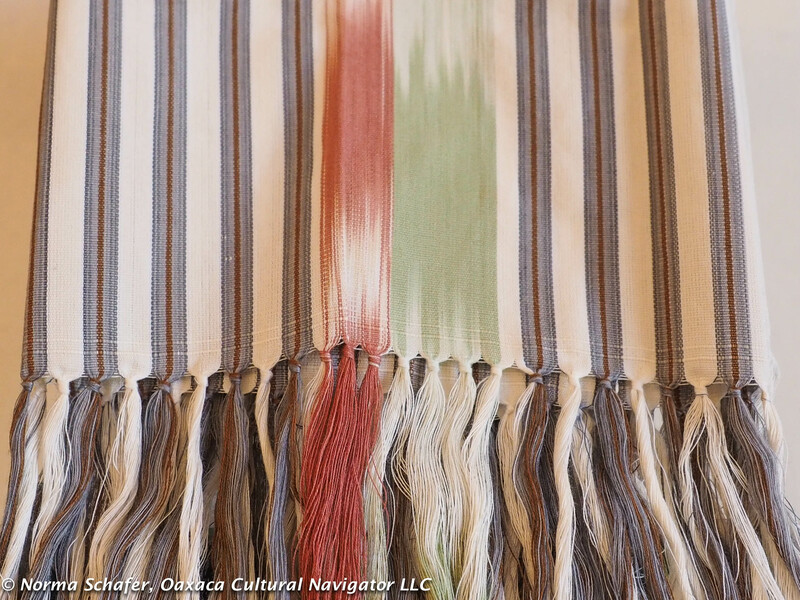 Ikat: a design technique where the warp threads are first dyed before they are tied onto the loom and create the pattern in the cloth. Very time intensive! 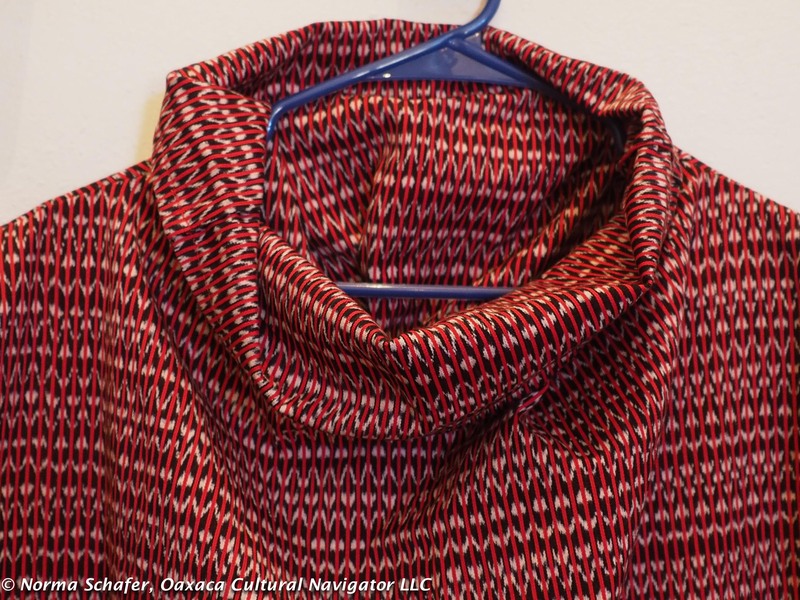 I also love to sew and so … I have three rebozos I have repurposed, designed and sewn into pullover ponchos. These are all cotton, have French seams and open sides — one size fits all. Just slip it over a tank top or bathing suit for a summer cover-up, or wear over a light-weight Tee and jeans to add pizzaz. Makes a nice evening wrap, too. 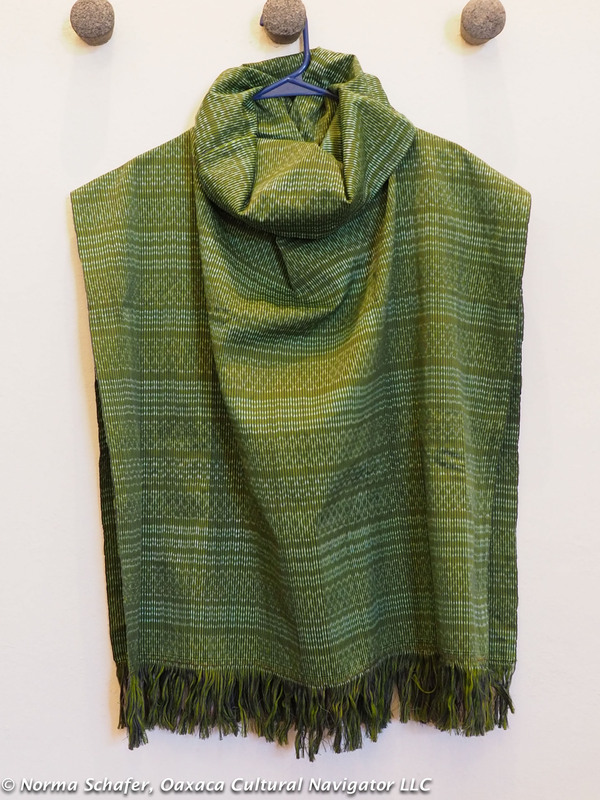 This post offers 3 pullover ponchos and 7 rebozos, scarves or shawls. Keep scrolling to see all. Send me an email if you want something! Pop-Up Sale: Buy Before March 29, 2016. After that, the sale goes away! 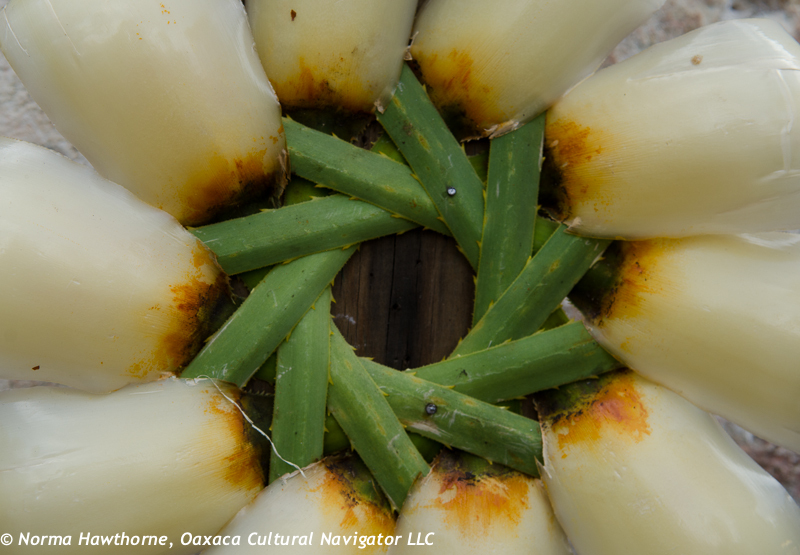 I’m leaving Oaxaca on March 30 for a several week visit with friends and to take care of business in North Carolina. I’ll take what you buy with me and ship to you (USA only) as soon as I get there. Send me an email and I’ll let you know how to pay. Many thanks. 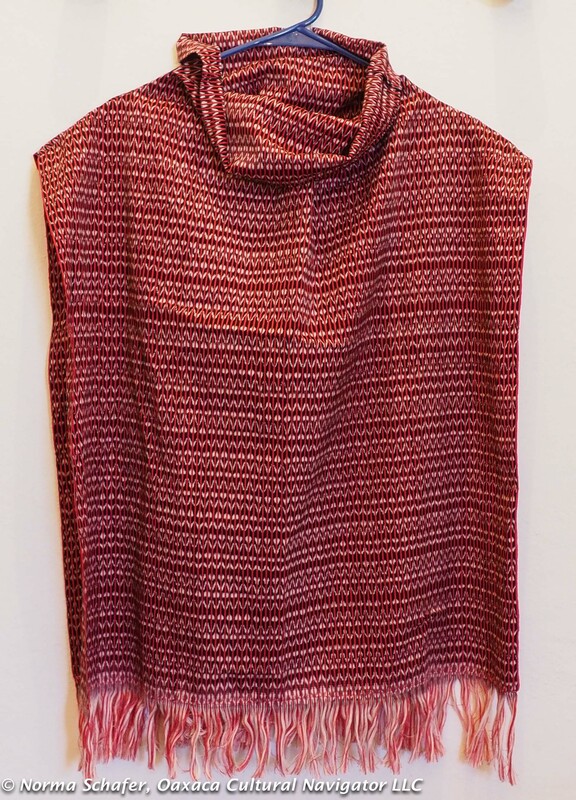 Pullover Poncho #1–Tomato Red and Black. Ikat cloth hand-woven on the counterbalance pedal loom. 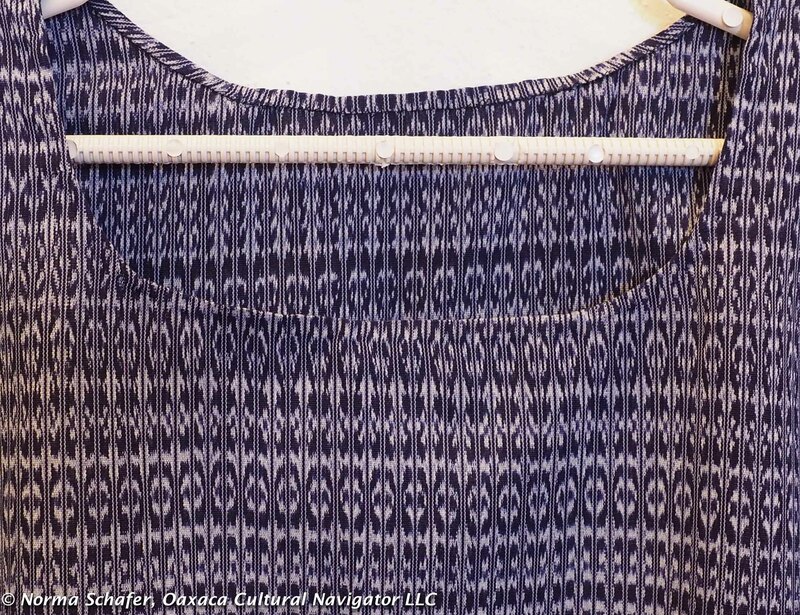 28″ long from the shoulder seam, 26″ wide and a 5″ collar that drapes beautifully. French seams. Open sides (sew them closed if you like.) One size fits all. $95 + shipping. Pullover Poncho #2 — Spring and Olive Green. 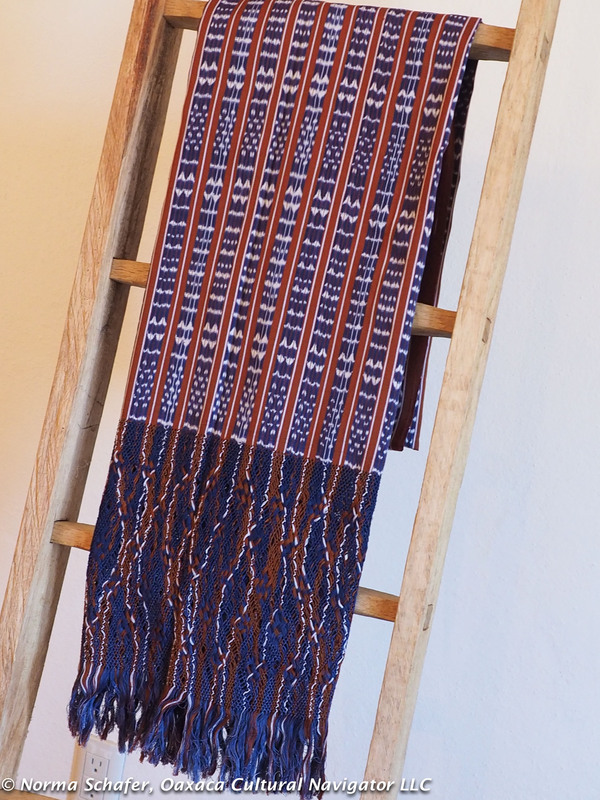 Ikat hand-woven cloth made on the counterbalance pedal loom. 27″ long and 29″ wide with a 7″ cowl collar. French seams. Open sides. One size fits all. $95 + shipping. See below. SOLD! 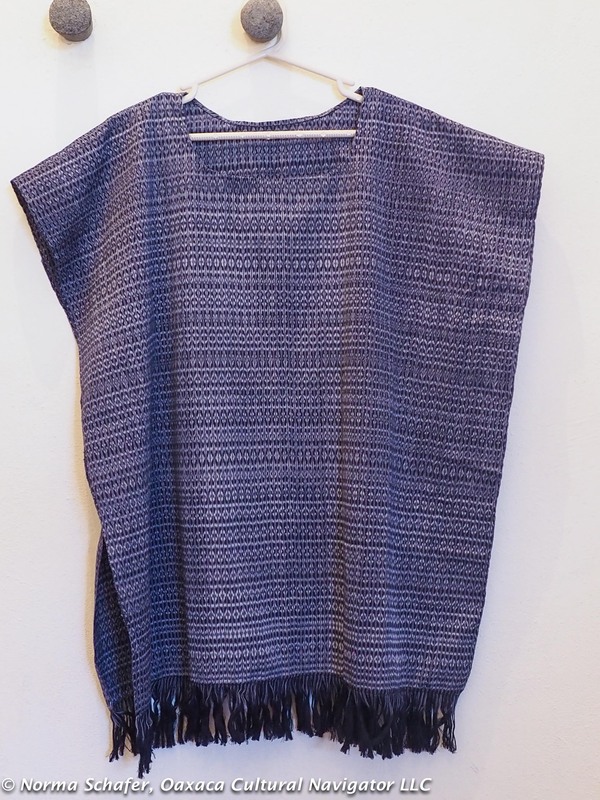 Pullover Poncho #3–Periwinkle Blue. Ikat cloth hand-woven on the counterbalance pedal loom. 32″ long from the shoulder seam, 28″ wide with a hand-stitched scoop neckline. French seams. Open sides (sew them closed if you like and voila, a dress!) One size fits all. $95 + shipping. 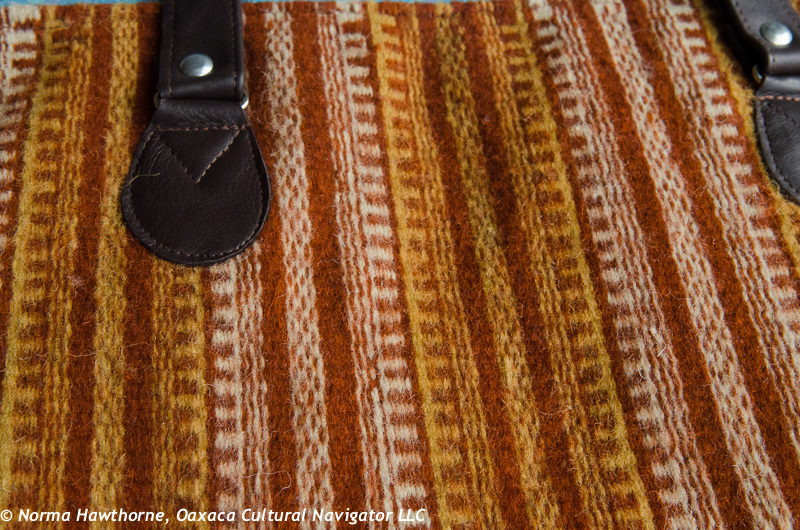 Rebozo #1: Blue and Brown by Fito Garcia, one of Tenancingo’s masters. 74″ long. 29″ wide. 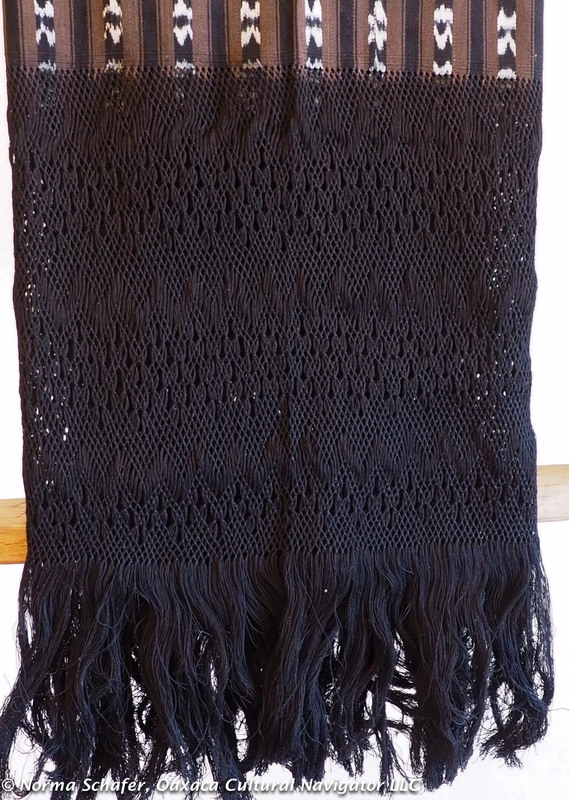 Plus a 13″ punta (hand-knotted fringe). Below. $185. + shipping. SOLD! 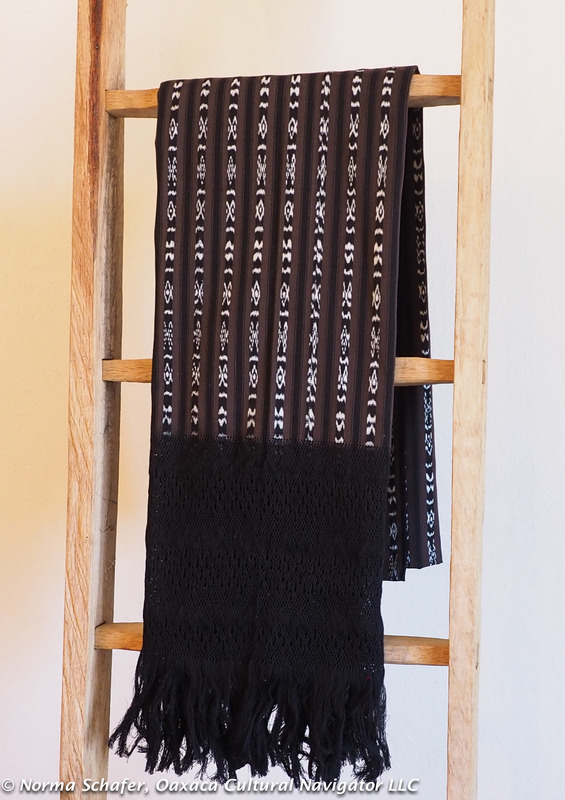 Rebozo #2: Black and Brown. 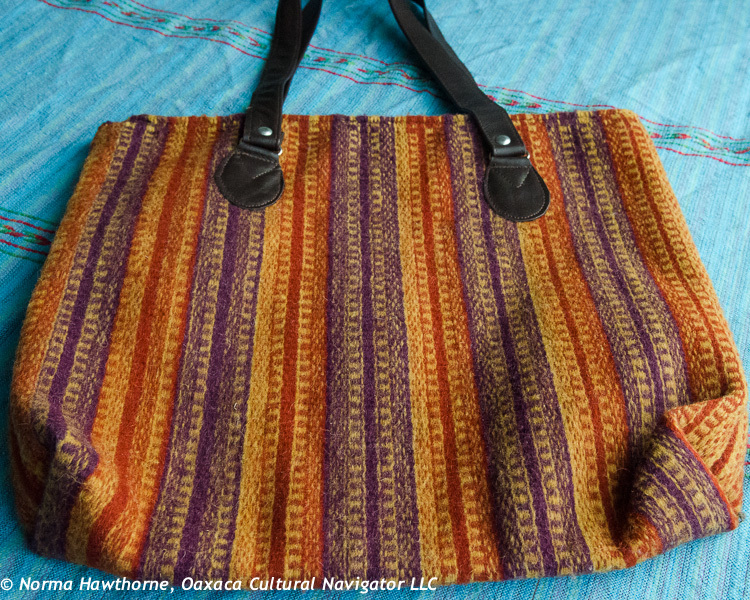 Dramatic ikat design with impressive hand-knotted 13″ punta. 74″ long, 29″ wide. $165 + shipping. Below. 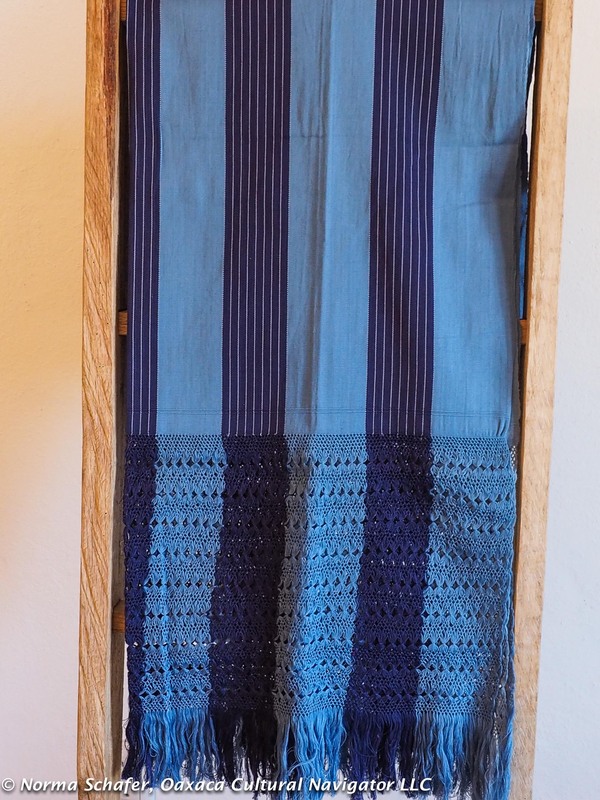 Rebozo #3: Very finely woven by master Jose Luis Rodriguez, soft as silk chalina in two-tone dark and light blue. 65″ long, 29″ wide with an intricate 13″ punta. $155 + shipping. See below. Please send me an email if you want to make a purchase. Thank you! 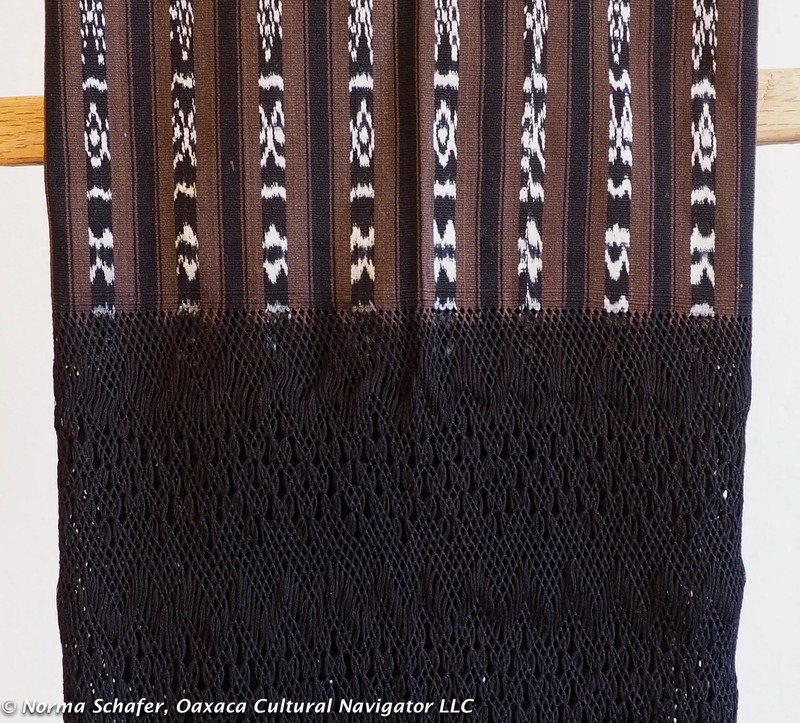 Rebozo #4: Forest green and navy blue ikat rebozo, 68″ long, 26-1/2″ wide, with a knotted 5″ punta. $125 + shipping. See below left. 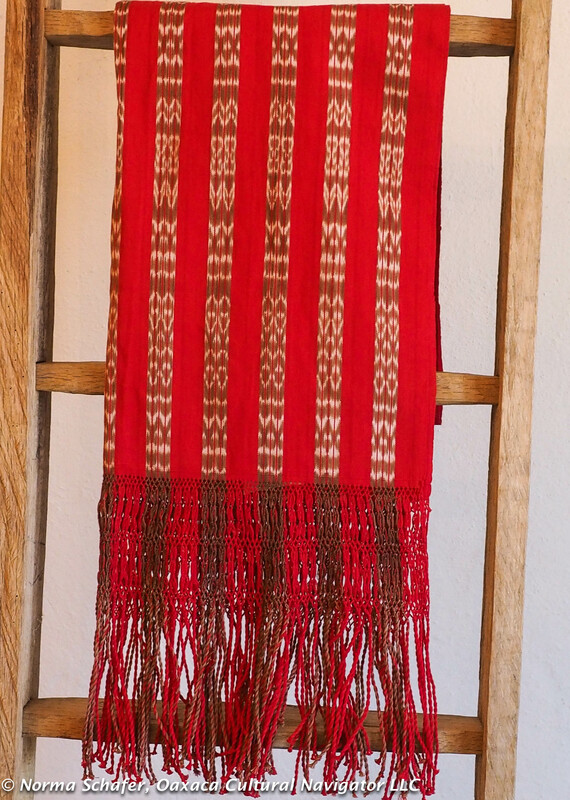 Rebozo #5: Red and camel ikat scarf, 20″ wide, 61″ long with 9″ punta. $85+ shipping. See below. 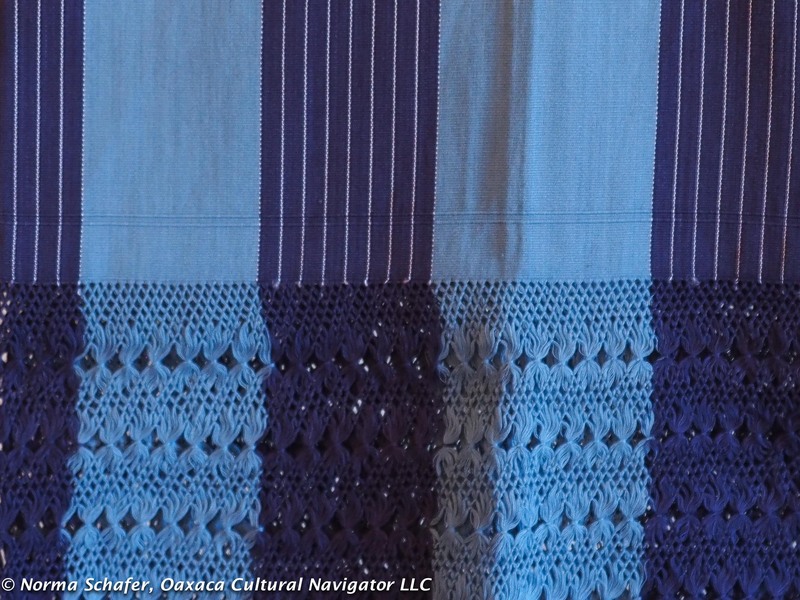 Rebozo #6: Mango scarf with blue ikat accent stripes and chaquira beads hand-knotted into the fringe. Great accent piece! $75+ shipping. See below right. 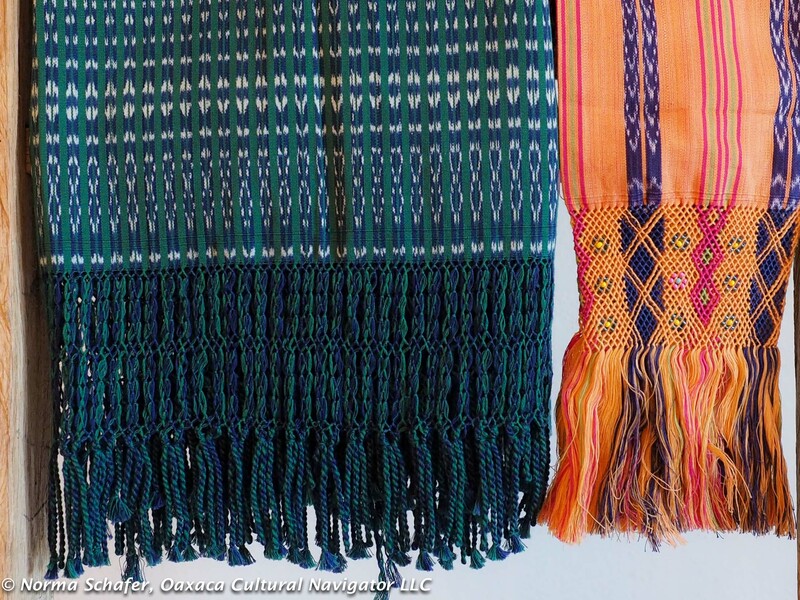 Rebozo #7: Above left is a beautiful, soft silky cotton ikat scarf, 58″ long and 18″ wide, with loose fringes. 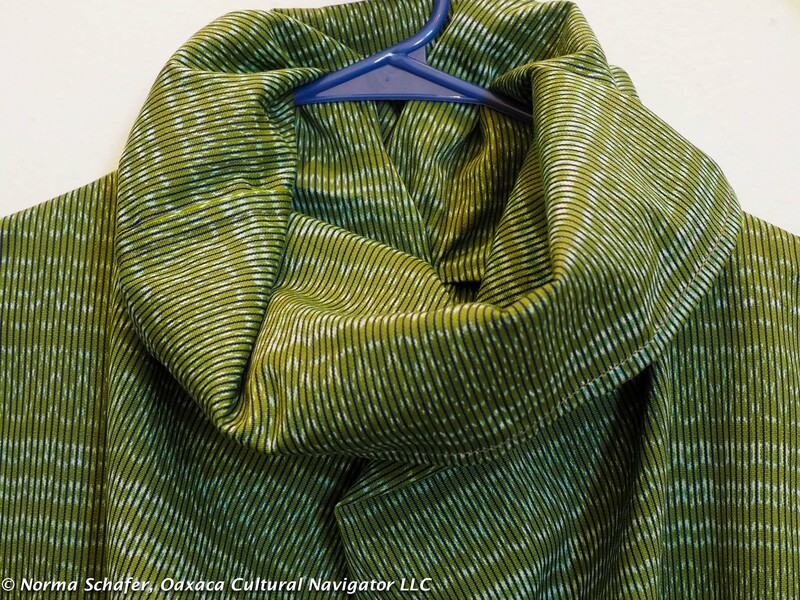 I loved this one because of the ikat gradations along the center panel of the scarf. $65+ shipping. 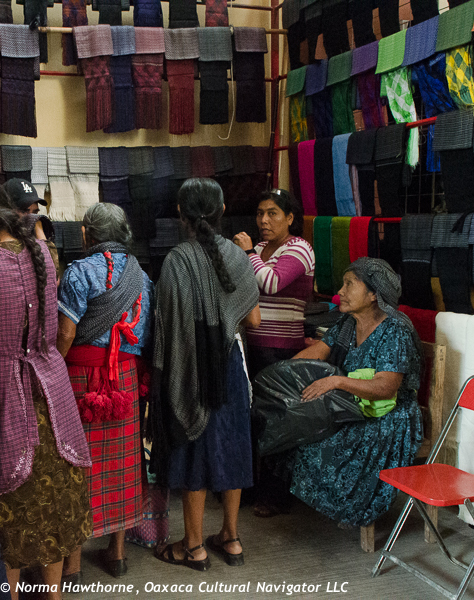 Come along with me on the next Rebozo study tour in September for the annual Rebozo Fair in Tenancingo de Degollado, Estado de Mexico. 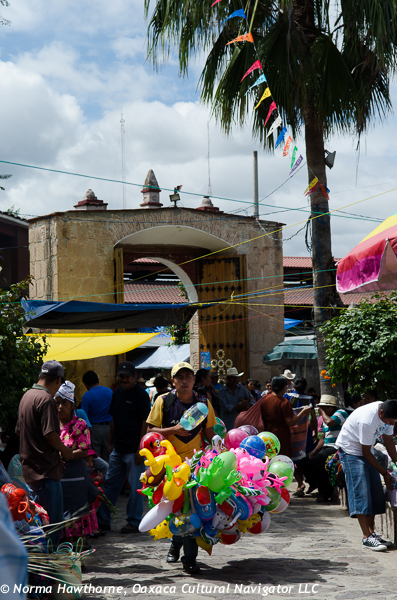 The festival of Our Lady of the Rosary — Fiesta de la Virgen del Rosario — is a big deal in Tlacolula de Matamoros, the county seat for the Tlacolula valley part of the Valles Centrales de Oaxaca.To give you a sense of it, I’ve changed the blog header once again. 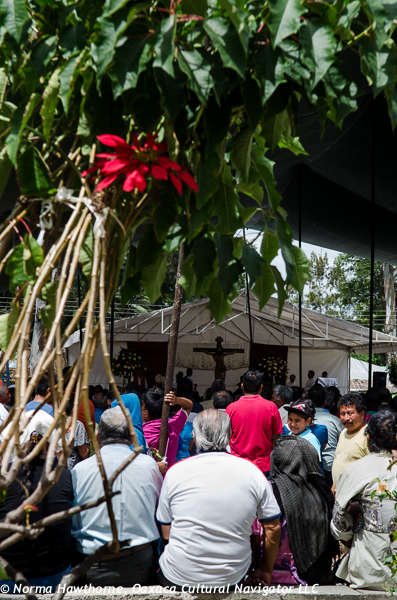 Last Sunday huge crowds gathered under a huge tent for a noon mass in the church courtyard. 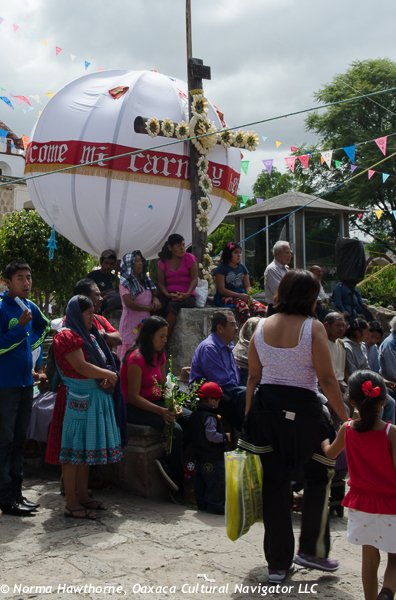 The sanctuary isn’t large enough to contain everyone who gathered here from the surrounding villages. 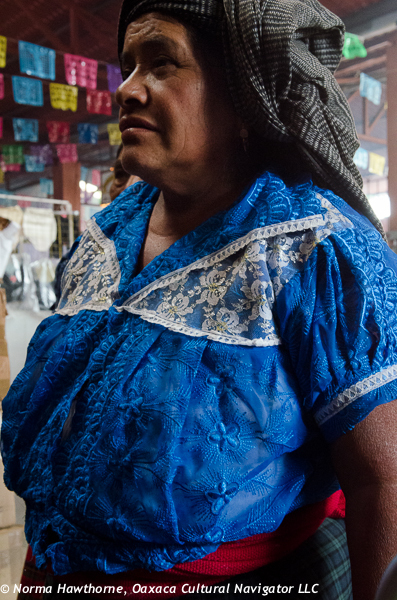 Sunday market day in Tlacolula is always a treat and a special day to meet up with family members and friends, and to buy supplies. This Sunday feast day was even more so. 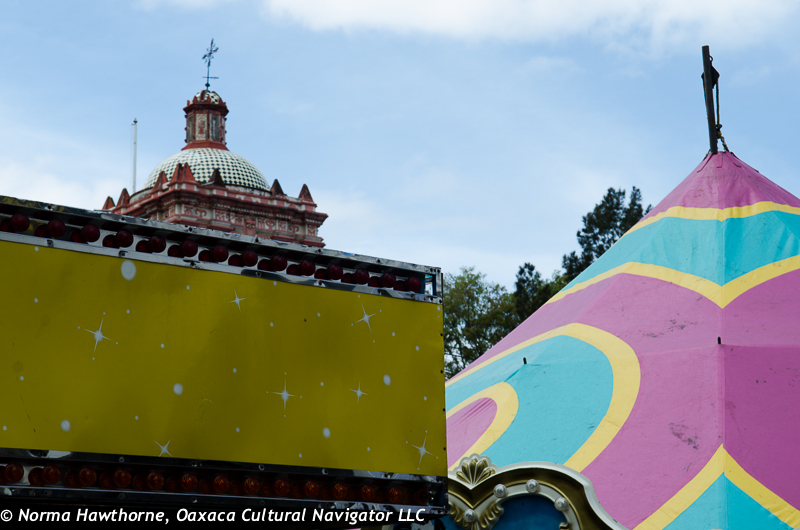 The streets were impassable because they had been set up with carnival rides, sideshows and a midway filled with carnival games. 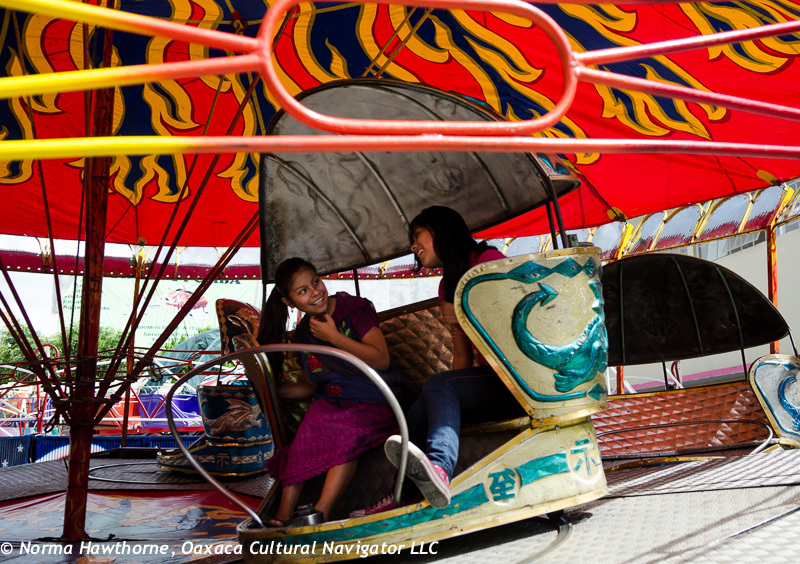 It was a juxtaposition to see women in traditional indigenous dress walking alongside bumper cars and pitch ball games. What caught my attention was the big top tent right beside the church dome on the skyline. We could tell this day was special. 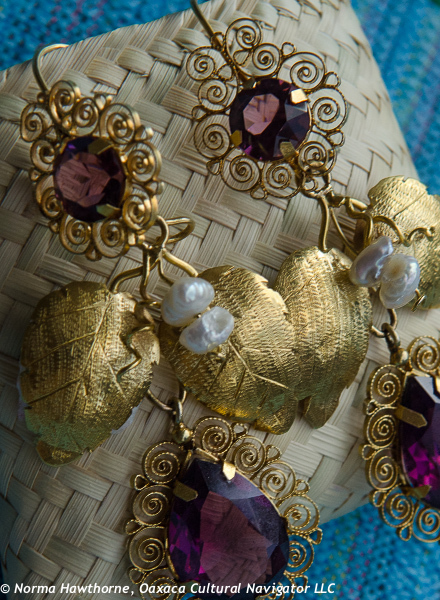 Women wore their most glittery rhinestone jewelry. Their blouses, skirts and aprons were embellished with sequins. 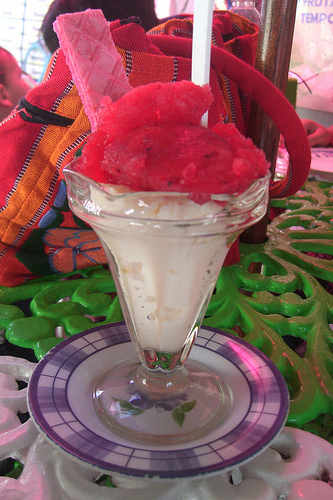 Families strolled with ice cream cones filled with Leche Quemada and topped with frozen Tuna nieves. That is NOT fish, folks! 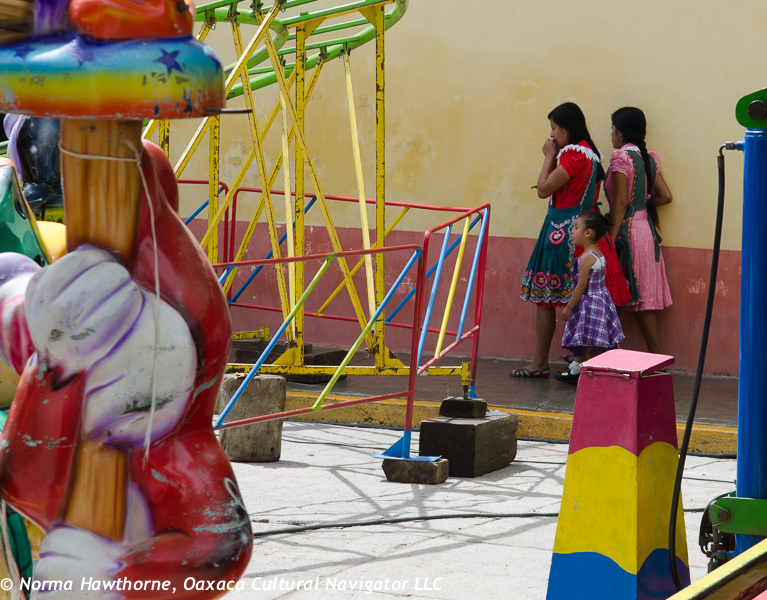 Children everywhere love cotton candy and Oaxaca is no exception. 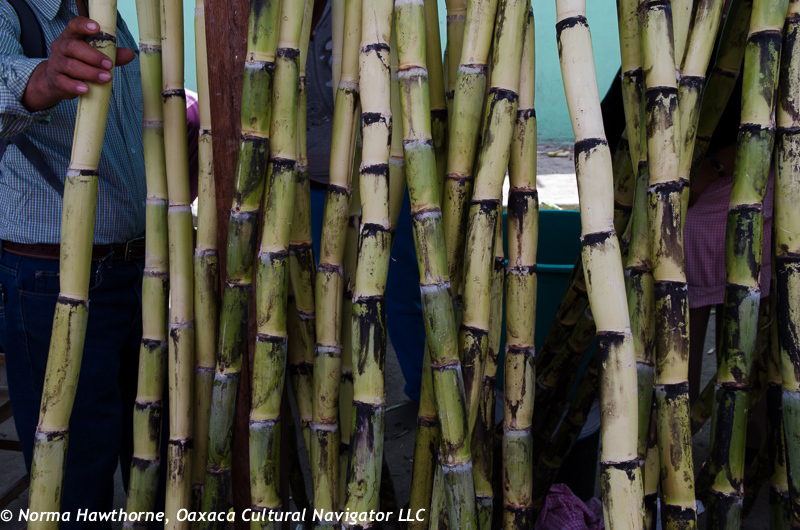 Men come to shop for things like cane and iron tools. 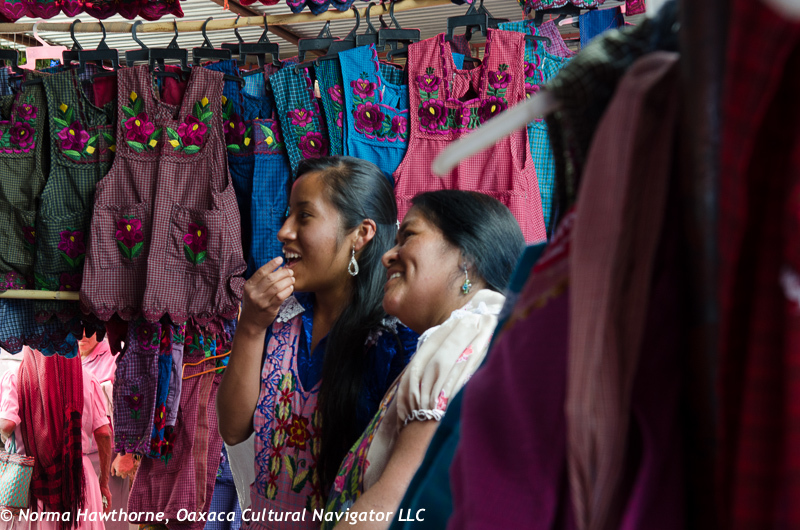 Women shop for scarves, shawls, aprons and food. Sheri and I met up at the rebozo section where she was on a quest. 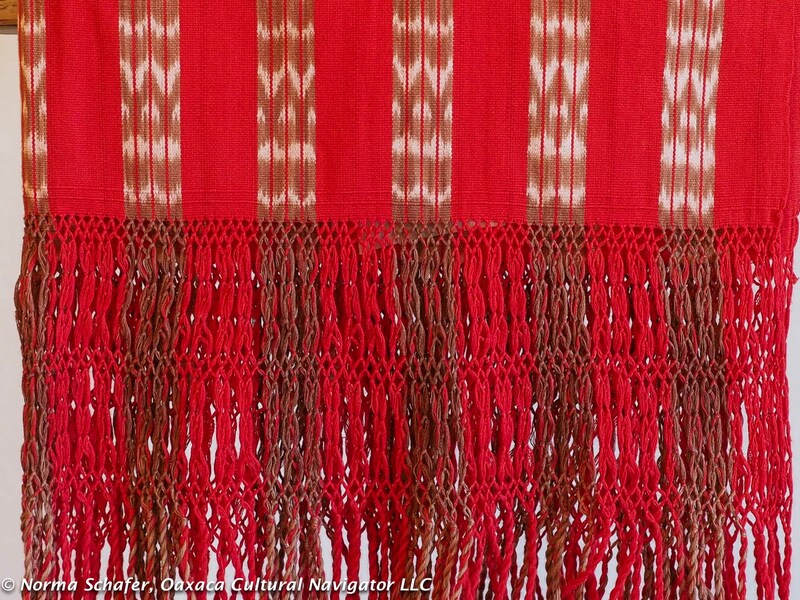 These shawls are ikat dyed and woven with either cotton or artecel, a silky natural fiber that is a recent substitute for more costly silk. 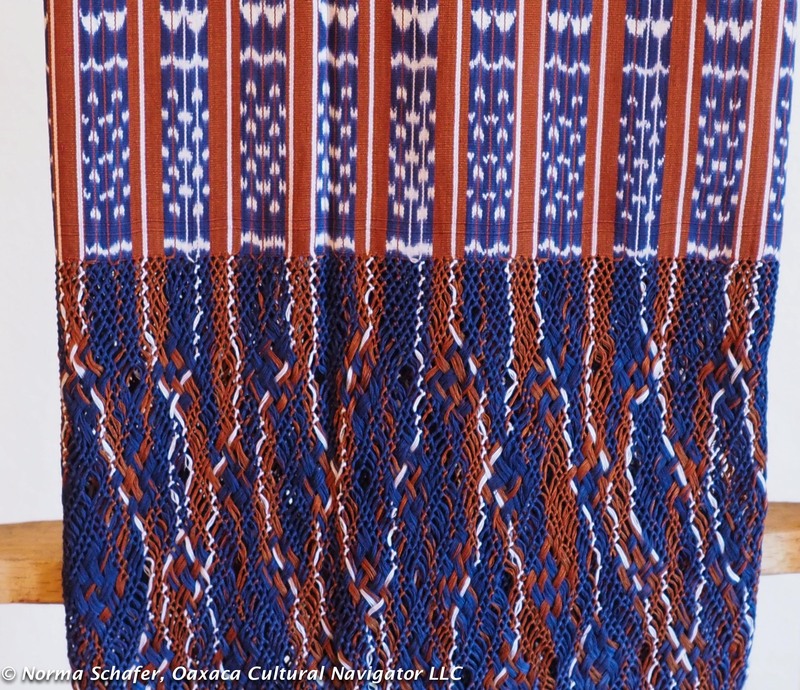 The ikat shawl is a utilitarian part of the local costume used to wrap babies, groceries, wipe perspiration and shade the head from the sun. We often see women who wrap it turban-style and then perch a basket on top, child in in one hand, a satchel in the other. 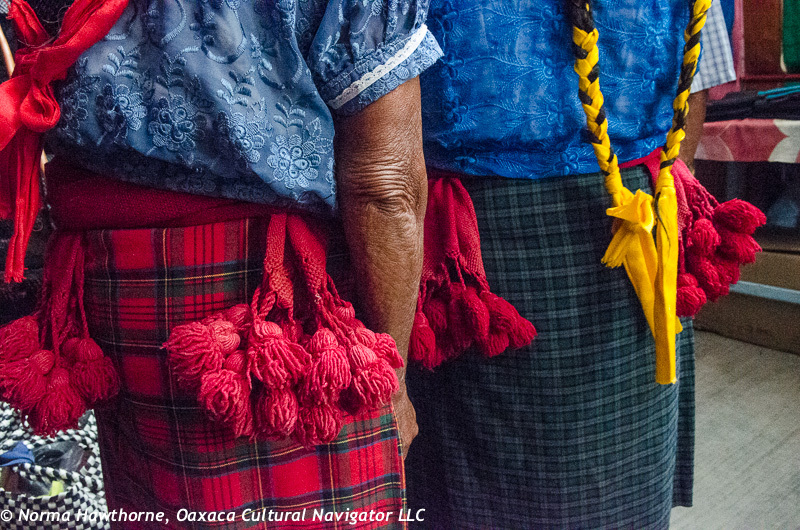 What never ceases to fascinate me are the handwoven, tassled belts that hold up heavy wool loomed skirts, and braids tied with colorful ribbon. 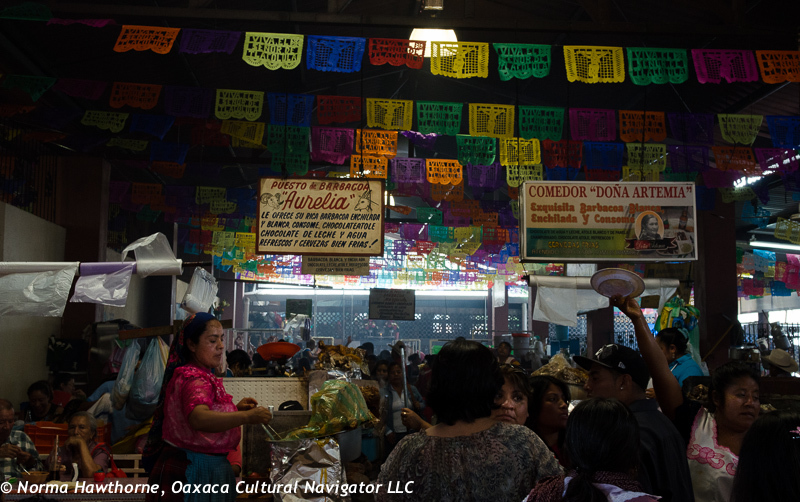 After lunch at Comedor Mary, including some of the best Mole Coloradito in the world accompanied by a shared cold Victoria beer, we headed down the main thoroughfare on foot to fill our shopping cart with fresh papaya, mandarin oranges, limes and avocados to take home. By now, it was late afternoon and time to go home. Sara and Woofy joined us later on the rooftop terrace as we sampled the San Juan del Rio mezcal I had bought the day before, accompanied by a fine sunset to close the day. I like to get there early by ten-thirty or eleven in the morning to avoid the crush of people and get deep into the market without elbowing my way through. If I eat lunch at one-thirty or two in the afternoon, this is earlier than the traditional Sunday comida, so I usually always can get a seat and a good selection of menu items at Comedor Mary. There’s always a line at the Banamex ATM (located near the pharmacy, the ice cream lane, and across from the church). Be prepared to wait a long time! 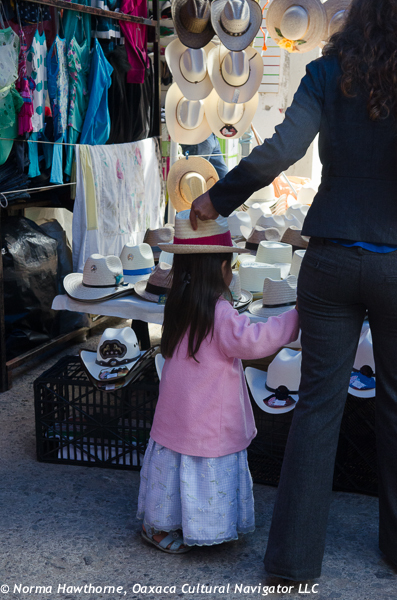 If you have a car, park in the lot across from the Pemex on the main street for twenty pesos. This is where the buses from Teotitlan del Valle and San Miguel del Valle go in and out. Prices drop at the end of the day, by four in the afternoon, when people want to pack up and go home. After a long day of travel yesterday, by bus from Puebla to the Mexico City airport, then to San Francisco with a connection to Orange County, California, I have settled into my son’s home in Huntington Beach. Handbag, approx. 15″ high x16″ wide, $85 + shipping. 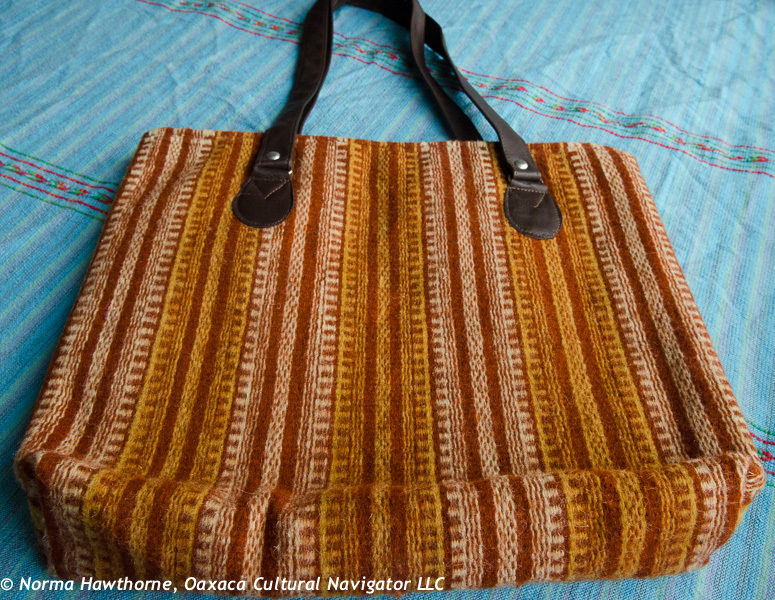 Dyed with wild marigold and nuts, lined with strong zipper closure, strong leather straps approx. 28″ long. 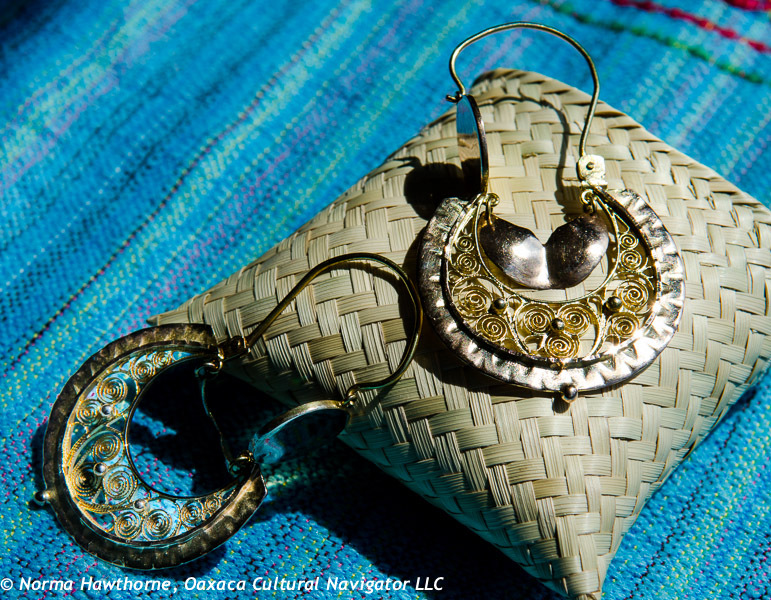 I’m carrying with me two beautiful hand-woven, tapestry wool bags that with natural dyes, made by my friend Lupe from Teotitlan del Valle, and a group of gold vintage filigree earrings and a pair of silver filigree from my personal collection. All are for sale here. 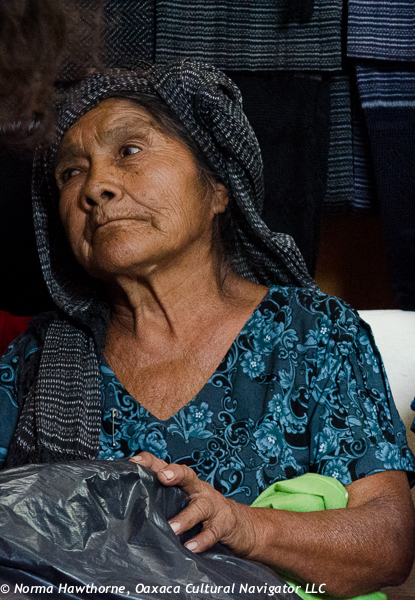 Lupe is a single mother of three sons ranging in age from elementary school to college. Her goal is that all boys receive a college education. 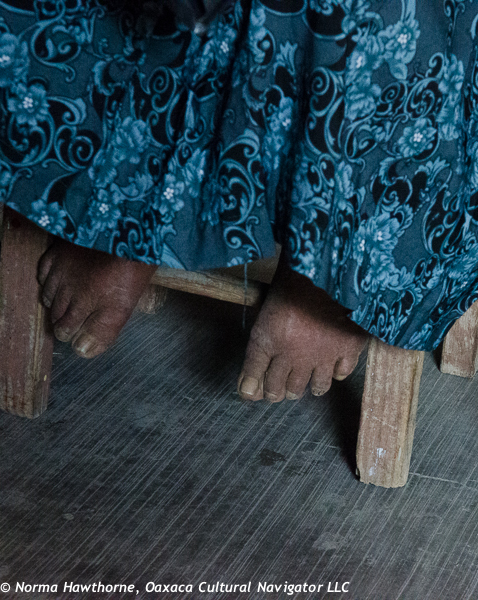 She makes ends meet, uses her small income to pay tuition and has few opportunities to market her work. Handbag, approx. 15″high x16″ wide, $85 + shipping. Hand-woven, 28″ leather straps, zipper, lined. Dyed with cochineal, wild marigold, nuts. Lupe is talented and resourceful. 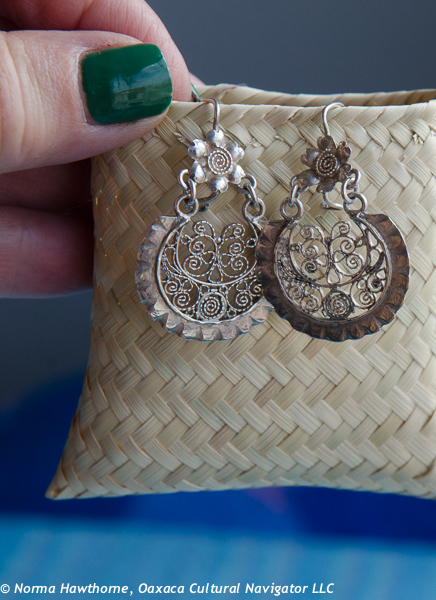 Recently, she got a grant from the state economic development office to take a course to learn leather-work. The leather is soft, the workmanship excellent. She is making lined shoulder handbags and I offered to help her sell these two. 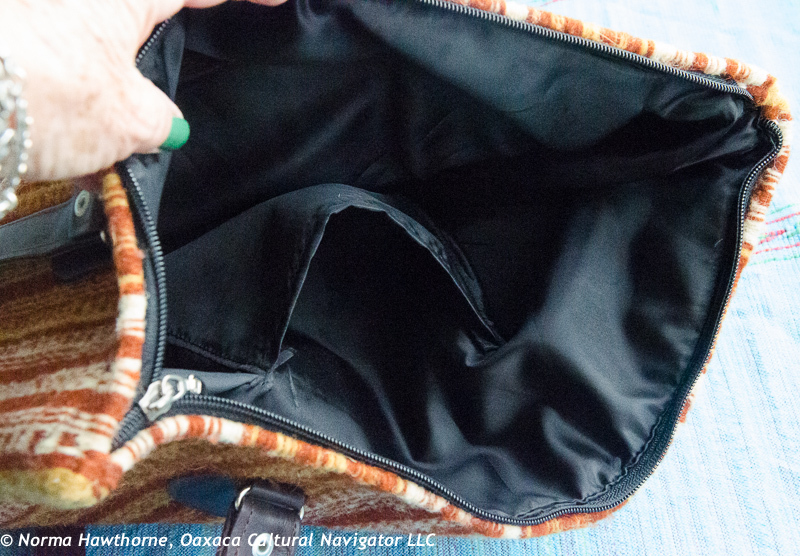 The leather shoulder strap measurements are approximately 28″ long, end-to-end where they are attached to the bag. Are you interested? Send me an email. 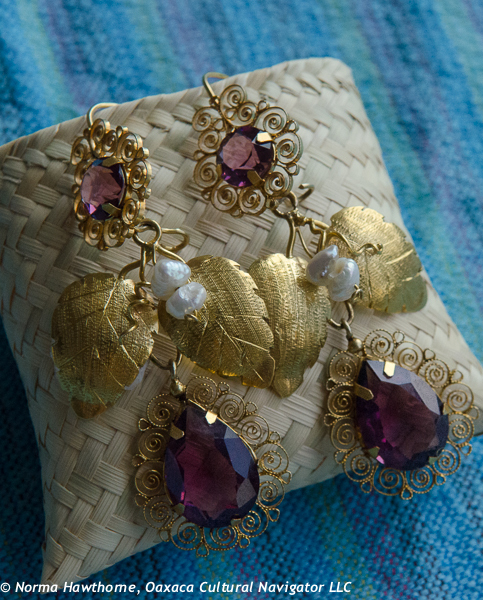 #1: Frida Kahlo Style 3-Tier Chandelier Earrings: Luscious 10K Gold Filigree, Pearl, Purple Stones, $495. plus shipping and insurance. 2-3/4″ drop from ear hole! Approx. 1-1/2″ at widest point of the two leaves. 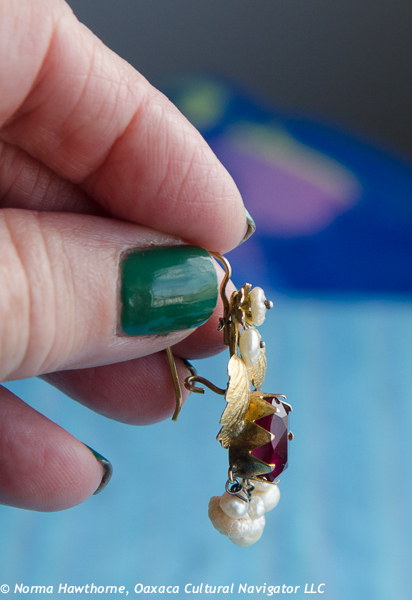 I came by this amazing pair of vintage 10K gold, pearl and stone earrings because another indigenous friend needed money to buy a refrigerator. How could I say no? The filigree work is gorgeous. 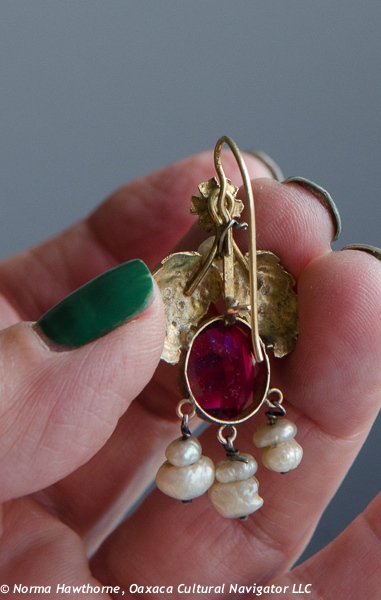 She says her father gave them to her about thirty-five years ago. 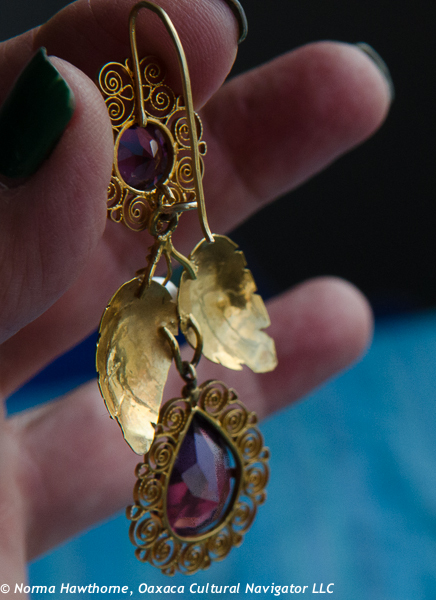 These earrings are substantial, elegant, dramatic. A true statement. Selling these and all the rest for the price I paid (smile). #2. 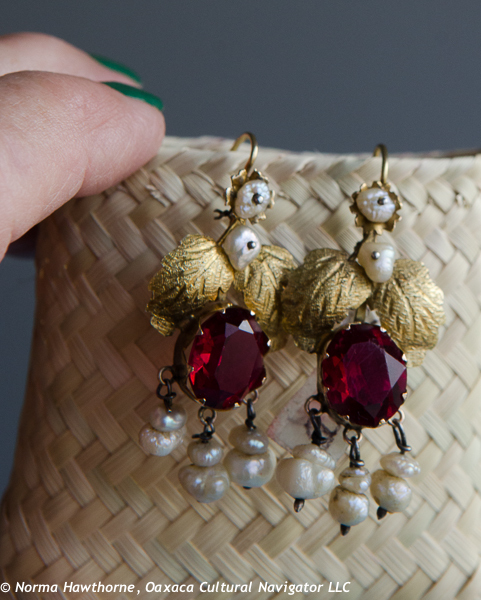 Juicy Red Vintage 10K Gold Filigree and Pearl Earrings. $195. + shipping and insurance. Deep bezel setting. You don’t find workmanship like this now! 1-3/4″ long from the ear hole and 3/4″ wide. #3. Mario Perez Sterling Silver Filigree Earrings, new. $225 + shipping and insurance. 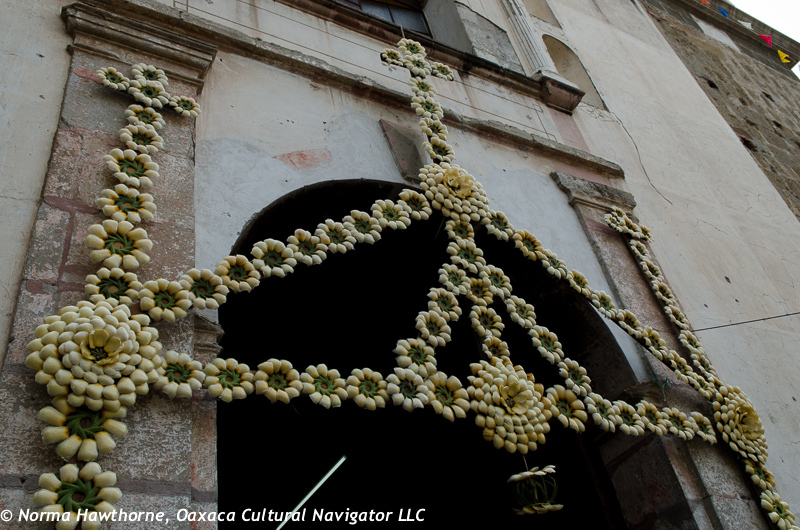 Among the finest, most intricate filigree workmanship in Oaxaca. 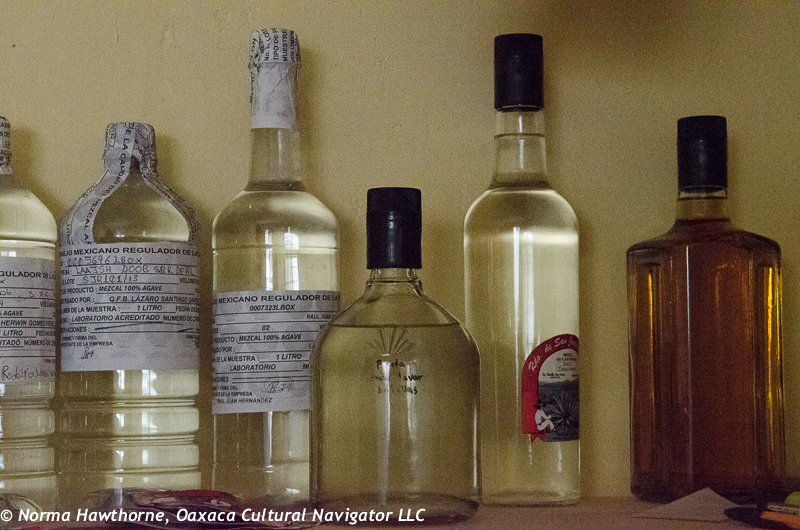 Mario has his gallery on the Macedonio Alcala walking street in Oaxaca. 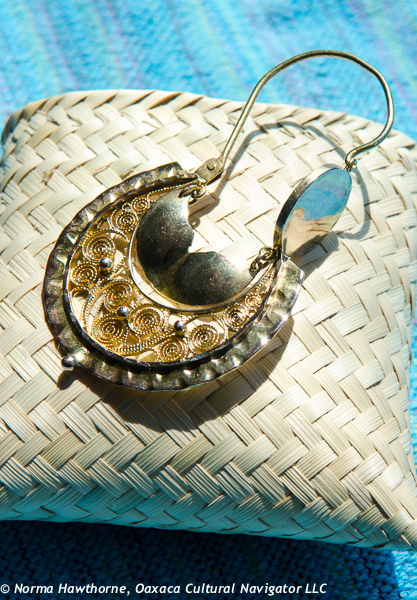 These earrings have secure French-style hooks. The dangling drop is about the size of a quarter. 1-1/2″ long from the ear hole, 1″ wide. For more detail, click on the photo. #4. 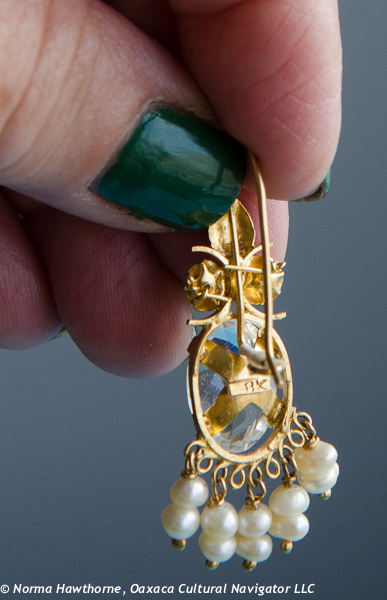 Vintage 8K Gold and Pearl Earrings. 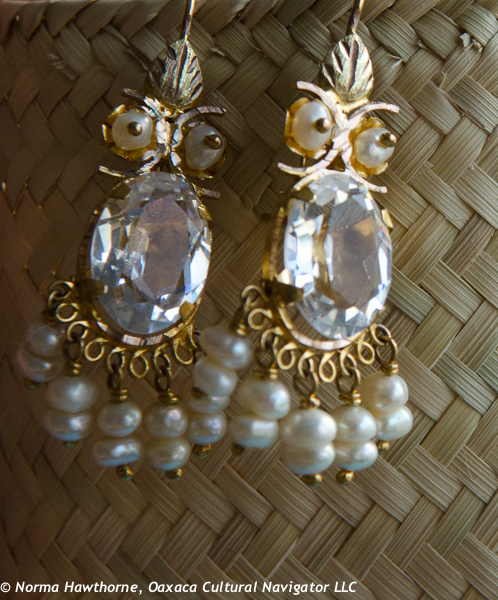 These dramatic dangles have a huge, oval, clear cubic zirconia stone that sparkle with every move. $165+ shipping and insurance. 1-3/4″ long from the ear hole and 3/4″ wide. #5. 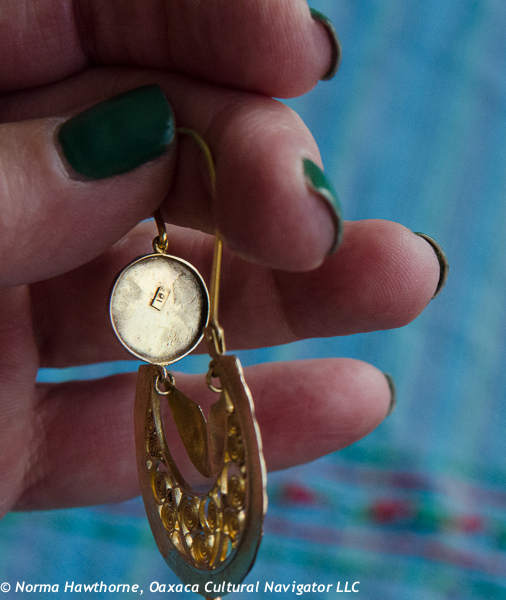 Vintage 10K Gold Filigree Traditional Zapotec Earrings from Teotitlan del Valle. These are probably at least forty years old. They were part of a family collection and the owner needed to raise money for home improvements. $385. + shipping and insurance. 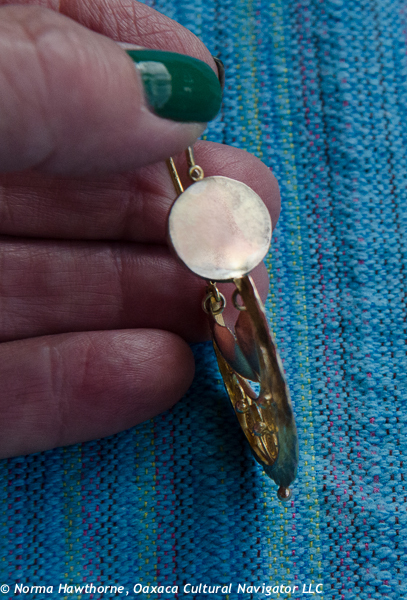 Hook goes from back of ear to front, with gold disk facing forward. 2-1/4″ drop from ear hole, 1-7/16″ wide.